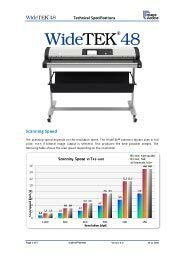 This section provides you with the technical specifications and data associated with the WideTEK® 48 wide format CCD scanner. Speed, scan size, power consumption as well as shipping dimensions and weight can be found in the detailed summary. These documents are the most detailed summary of the technical specifications. 1270 mm (50 inch) width. Information about the maximum scan length in the technical specification. Embedded for sRGB, Adobe RGB and native. Individual profiling via web based Scan2ICC subscription.